"Louis Nagel is a musician who thinks about the meaning of the notes he plays. He performs a wide range of repertoire with both emotional involvement and analytical understanding. Over our long friendship we have shared many discussions about repertoire, technique, and interpretive issues. His teaching and playing reflect his love and intellectual grasp of music. " I have written articles that have appeared in Clavier Companion, American Music Teacher, and contribute a column to the Michigan Music Teacher's Newsletter. I have also contributed chapters on Schumann's Papillons and the music of C.P.E. Bach to the two volumes of The Pianist's Craft. No, Johann Sebastian Bach did not live for four hundred years! But he occupies a pivotal position in the history of keyboard music. The works on this unusual CD span four centuries, exploring the influence on Mendelssohn, Hindemith and Shostakovich. 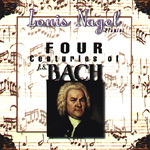 Although some of these pieces were originally composed for the harpsichord, all of the works on this disc are performed on the modern concert grand by Louis Nagel. This recording is available at Equilibrium Records. Click on the selected tracks below to hear a sample of the music.